A few weeks ago I alluded to the fact that having switched to a low carb diet several years ago, I’ve become something of a streak steak snob. So just in time for Labor Day, here’s today’s tip, and I’m not talking Tri-Tip. It’s generally agreed that when you visit a fine steakhouse, the cut of choice is Porterhouse. This steak is the kissing cousin of the more common, and affordable, T-Bone. The distinction is the relative size of the tenderloin steak compared to the strip steak on the opposite side of the bone. The T-bone and porterhouse are steaks of beef cut from the short loin. 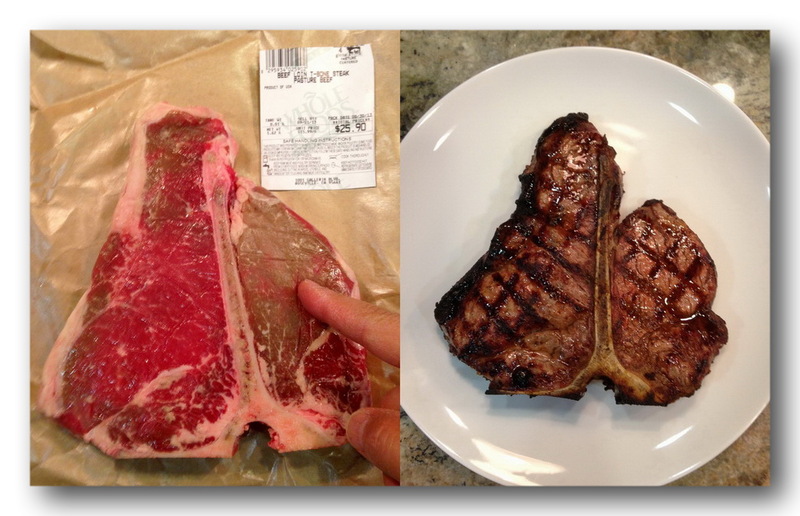 Both steaks include a “T-shaped” bone with meat on each side. Porterhouse steaks are cut from the rear end of the short loin and thus include more tenderloin steak, along with (on the other side of the bone) a large strip steak. T-bone steaks are cut closer to the front, and contain a smaller section of tenderloin. I’m pointing to the Tenderloin Steak side of the bone. Wow. There aren’t many deals at Whole Paycheck, but if you’re lucky this qualifies. Most ‘normal’ groceries don’t carry Porterhouse, you need to visit a local butcher if you are Jonesing for the real thing. But I’ve discovered, and here comes the tip, if you visit Whole Foods early in the morning you may be able to pick up one of the first slices off the short loin, which is in fact Porterhouse but sold at T-Bone prices. This could possibly be the only deal you will ever find at “Whole Paycheck”. As you can see in the picture above, I’m pointing to the Tenderloin side of that fabulous piece of steak, and there is no doubt we are looking at Porterhouse. If it was a normal T-Bone that tenderloin section would be 1/4 as big. Of course you can’t count on finding this every day, my experience is that I get lucky about 50% of the time. Your mileage may vary. The finished product is on the right. Get your grill to direct high, let it get nice and hot. Then 90 seconds on the first side, rotate the steak 45 degrees and leave it for another 90 seconds to get those nice grill marks. Then flip it over and repeat. Total grill time 6 minutes, just a bit charred on the outside, nice and red on the inside. Correction: A previous version of this post incorrectly stated that I had become a “streak snob”, when in fact I am a “steak snob”. Thanks to KStJ for bringing this to my attention. Streak snob? Are you turning your nose up at people of the 70s running through record stores with no clothes on?